Showing results for tags 'dna 250c'. Who can explain how the Battery-> Charge function works. When using, I see only the inscription "Unknown"
Another ripoff of Hyperar's Simple Series-- super intuitive and fully functioned themes without a bunch of clutter. For sure my favorite theme to riff on. All I did here was throw up some backgrounds, change some colors, and strip the lock screen down to just the stuff Elmo wanted. All functionality and utility is thanks very much to Hyperar. 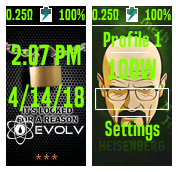 This is a modified version of the DJLsb theme that came pre-installed on my Lost Vape Paranormal/Therion 75c mods - full credit goes out to Daniel@djlsbvapes for the design of this excellent user interface that offers an array of functionality without being too cluttered and over complicated. 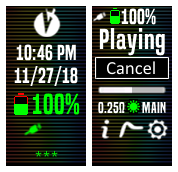 I was unable to find a Replay enabled version, so took up the challenge of integrating Evolv's main screen UI so I could continue using my favorite theme with the added benefit of Replay. Edit: Daniel@djlsbvapes as since released an updated version with Replay, a copy of which can be found on his website. Older 75c devices - so long as you have taken all the right steps to upgrade your firmware this theme will work just fine - I found YouTube video: 'Replay Mode - how to get it on your 75C' by 'vaping v1ck' helpful, please also check here for guidance. 250c devices - no firmware upgrade required, just upload and go. Happy days 😉 UIColourToggle function available in V2.1 onwards. This feature appears on both the MAIN and REPLAY screens allowing you to toggle your UI between white and a mono color of your choosing for matchy matchy customisation i.e. orange matches up really well with silver Paranormal/wooden panels, as does Stealth with my carbon/black edition Therion for a classy toned-down look - other colour options to suit Mirage are also available from the download section. UI toggle buttons are conveniently located to provide quick switching between mono color and the default bright white display - useful in bright sunny conditions 🙂 Other modifications include: - PowerBank UI included to support USB-On-the-go (new) - ‘Warmth of Puff’ feature included on REPLAY screen - Up to 4x battery voltages included - Minor tweaks to button/field positions and removal of separation lines to provide clearer/ergonomic viewing. - Lost Vape emblem in place of full logo - for sharper imaging. - Revised battery indicators for improved vividness. Fully optimised for dna250c, and cross-compatible with dna75c devices ColourToggle options: Green, Orange, Stealth, Blue, Red, Cyan, Purple and now Magenta...choose to best suit your setup. 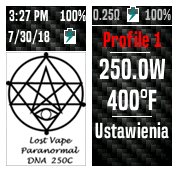 Info Paranormal DNA 250C Geek Vape Zeus dual coil Advanced Vape Supply triple core fused clapton SS316L wire ~.124 ohms Set to 155w Set to 440 degrees F No punch No preheat These settings work very well for me. It seems like most people use preheat but why? Why not set the wattage high and let the chip back off the wattage when it gets to the correct temp? I also see people saying SS wire builds should have a higher resistance but I've used the same setup for months with no problems. Any thoughts or recommendations are appreciated, thanks. DNA 250c T1 Balanced tap out Pin arced and burnt out. As long as I don't use the usb to charge is it fine? So I am not sure how (possible juice leak?) but on one of my early prototypes mods I designed the T1 balanced tap out pin on my DNA 250c got arced and burnt up to where there is no longer any viable connection from the tap pin. I never use the USB to charge any of my mods, and I would like to keep using the chip to test builds I do. As long as I don't use the usb to charge is it ok to still use the chip with no connection to the positive from the T1 connection? Or does it also balance the amount of draw from each battery? I've never understood if which was the case. Any info would be great. I would like to get it fixed but I am not sure if that is something that would be covered under Warranty. The chip still functions just fine and the damage was limited to just the T1 connection pin. Thanks in advance for your help. Based on the default theme with some extensions. So I just got my first DNA mod and I'm really excited ,worked my way through escribe but me being nitpicky I have examined the mod itself like a vulture. I found a few small scuffs right out of the box and I'm wondering if there are any solutions to make them dissapear. Also when I unsealed the box and turned on the mod I saw that it had 11 puffs registred on it at 5-11W. I found it weird but when I got the mod everything was sealed tight and brand new. Is it normal? Maybe manufacturer checks? Thanks in advance! This is a theme i made using images and ideas from ScaryMonkeyMan's Vape Boy 3000 theme. 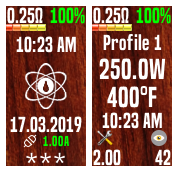 I made this theme for a DNA 250c so feel free to edit whatever you want. 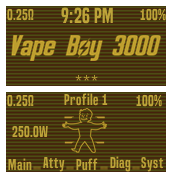 This theme takes on more of a New Vegas or amber colored pip-boy. I also updated the vault boys limbs to turn red when the battery gets lower as if he is being crippled. Special thanks to ScaryMonkeyMan, most of the material i sourced from his theme. This is a nice looking theme and easy to understand. The screens are easy to work with. Main Screens shows you everything you must know. The functions are easy to switch. It based on a simple system. Withe new ideas, i update this theme. So if you have some ideas, don´t be shy and tell me. Have fun with it. This is a little AHS Cult theme. Hope u enjoy it. This is my Alien theme. its pretty minimal. hopefully you like it. This is my Harry Potter Theme. It includes all functions. So guys, have fun with it. Das ist mein Harry Potter Theme. Es enthält sämtliche Funktionen. Also Leute, habt Spaß damit. DNA 250c. Breaking Bad Theme. Default theme apart from changed to background, font colour and wattage increments. basically default theme. colour font changed. watts increments changed.